Boigu Island is the most northern point of Australia, located four kilometres south of Papua New Guinea. Boigu Island forms part of the Top Western Cluster of the Torres Strait Islands. Dauan and Saibai islands make up the remainder. The island is relatively small and low-lying, stretching for 18km with an approximate area of 90km2. The population of Boigu Island is approximately 270 people. 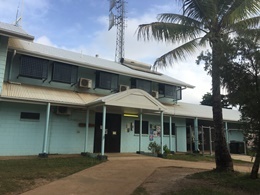 Boigu Island Primary Health Care Centre is managed by a small primary health care team consisting of remote area nurses, Indigenous health workers and ancillary staff. This health centre provides primary health services to the people of Boigu Island. The centre is open daily, with a nurse available after hours for emergencies. Visiting services to the centre include medical services, optometry, midwifery, dietetics, chest clinic (thoracic) and sexual health clinic also visit the centre every month. Level 2 emergency care centre.